This special occasion vest and shorts set comes in three new colors this season, Khaki, Navy Blue and Chocolate Brown. This is the more formal cousin of our seersucker vest and shorts set. This classic outfit is comfortable and perfect for your more formal spring and summer special occasions. It is well-suited to warm day and balmy evening events. 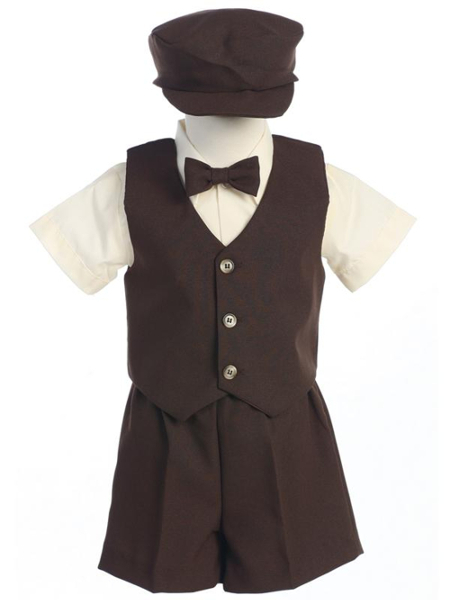 The 5-piece set includes a vest, bow tie, shorts, hat, and an ivory short-sleeve dress shirt. The shorts, vest, hat, and clip-on bow tie are a very soft wrinkle resistant polyester. The shirt is a poly-cotton blend. The outfit is machine washable on cold and we recommend that it be line dried. This set is made in the USA by Lito and comes in sizes 6-12 Mo, 12-18 Mo, 18-24 Mo, 2T, 3T, and 4T. Note: The ivory short-sleeve shirt can be exchanged for a white short-sleeve shirt on request.